Magician shows a rope looped over his fingers. 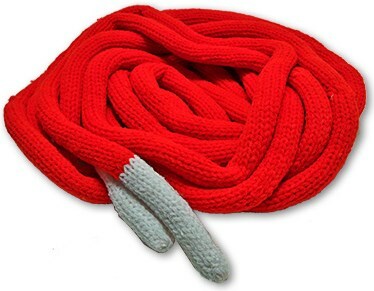 The two ends of the deluxe rope has white ends (regular rope has no separate color) to make them more noticeable. After showing the long rope, passing if from one hand to the other loop by loop, the magician ties the two ends together and pulls of the loops from one hand, one by one. They for a strange knotted chain. Finally the magician pulls each knot undone and finds he has four complete loops without knots and last one with a knot.